is more affordable than you think. We help cover what your insurance doesn't so your budget stays safe. What is the Home Helper Program? Homeownership can be expensive. Very expensive. Wouldn't it be nice if there was one program that could help lower multiple homeowner costs while offering peace of mind at the same time? Well, now there is! Covers customers from the high cost of repair and replacement caused by electrical line wear and tear ($1,000/year) and surge events ($500/year). Use for things like restaurants, local deals, online purchases, movie tickets and more... over 500,000 ways to save! Home Help customers choose to use their credit toward an A/C or refrigerator filter — something homeowners should change at least once every six months. 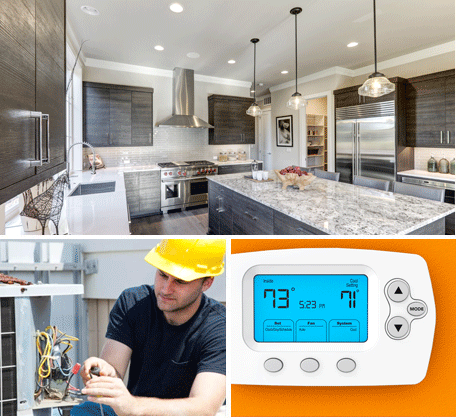 Crucial homeowner tips to help keep systems and appliances running smoothly all year long.. Questions? Call us at 844.833.8921 M-F 9am-9pm; Saturday 9am-5pm. *See terms, conditions and limitations. Covered items must be in good working order at time of activation. Service call fee due at time of service. This fee is separate from the monthly plan premium. Non-covered and incidental charges may apply to certain repairs or replacements. Not available in all states; subject to sales tax where applicable. 1Card is issued by MetaBank(r), Member FDIC, pursuant to a license from Visa U.S.A. Inc. Cross Country Home Services, Inc. is not affiliated with MetaBank(r), or any of its affiliates. The services, products or activities of Cross Country Home Services, Inc., are neither endorsed nor sponsored by MetaBank(r), or any of its affiliates.